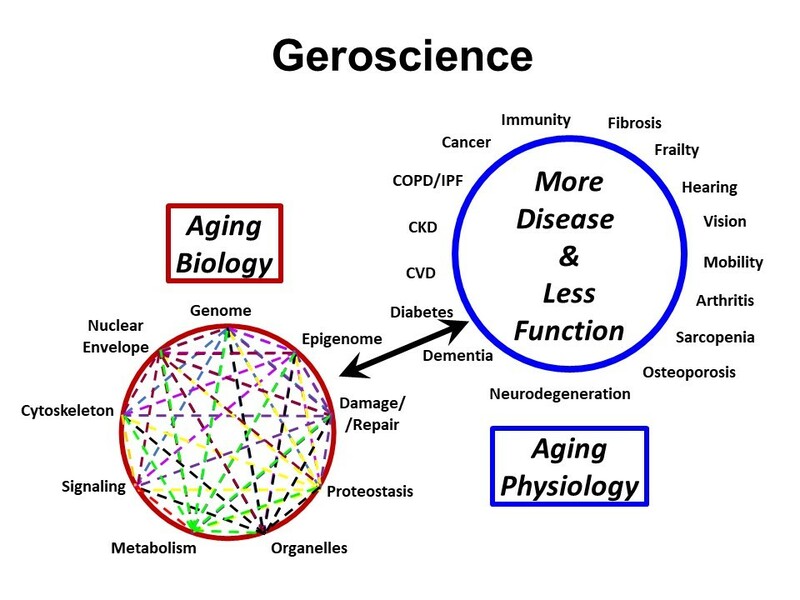 Geroscience is a multidisciplinary approach to understanding the aging process. As we grow older, we are more likely to be diagnosed with one or more chronic ailments. These ailments can include heart disease, diabetes, and cancer. Debilitating conditions such as like arthritis, fatigue, and frailty are all part of aging. These ailments rob us of our quality of life. The question is: How does the aging process affect the disease process and our susceptibility to it. Does aging bring on chronic disease or does chronic illness set in motion the aging process? Geroscience studies the genetic, molecular, and cellular mechanisms that make aging a major risk factor for chronic disease in seniors. In 2013, 500 scientists, gathered on the NIH campus for a first Summit meeting, Advances in Geroscience: Impact on Healthspan and Chronic Disease. The Summit’s goal was to study the aging process and the mechanisms that trigger the occurrence of chronic diseases. A second goal was to promote collaboration among researchers specifically in the context of aging. Topics discussed were inflammation, immunity, adaptation to stress, genetics, metabolism, and molecular damage. A diagram showing the relationship between the biological processes of aging and age-related diseases and conditions. Courtesy National Institute of Aging. People are living longer today because of great advances in medical care. But many seniors suffer from chronic illnesses such as cancer and heart disease. The goal of geroscience is to provide diagnostic tools that can reduce age-related disease and disability. For example, some diseases can cause the loss of function and resilience associated with aging This leads to increased susceptibility to further disease and disability. Researchers want to discover treatments that will strengthen their immune systems. In Alzheimer’s disease, for example, studies focus on what happens in the brain. But, what about the rest of the body and other systems? The vascular system and overall metabolism. Going this route gives a more holistic view of individual diseases and conditions. The ultimate goal of geroscience is to accelerate research into the basic mechanisms of aging. This will provide improved therapies.